Several of President Donald Trump’s top aides — including former chief strategist Steve Bannon — have failed to file legally required financial reports after they were dismissed this summer, according to the White House. WASHINGTON — Several of President Donald Trump’s top aides — including former chief strategist Steve Bannon and former deputy assistant to the president Sebastian Gorka — have failed to file legally required financial reports after they were dismissed this summer, according to the White House. Reince Priebus, the former chief of staff, filed his report this week, according to a White House official, after McClatchy requested his form multiple times and reached out to him for comment. Priebus left the administration in late July, and the filing came well beyond the 30-day deadline for filing these reports. In total, at least four senior White House staffers have not filed termination reports, which outline their financial activity while serving in the White House. They include Ezra Cohen-Watnick, who served as senior director for intelligence programs for the National Security Council for seven months, and Middle East adviser Derek Harvey, who served on the National Security Council for six months, according to the White House and the Office of Government Ethics. A spokesman for Bannon, Arthur Schwartz, said in an email that Bannon did file, but he did not provide timing on when Bannon did so. White House records, however, on Wednesday showed that Bannon still had not filed. Government observers have long complained that the administration has failed to make ethics a priority by allowing officials, including Trump son-in-law and top adviser Jared Kushner, to retain certain business interests, turn in financial disclosure forms late and spend money at the president’s hotels and resorts. Since the start of the term, a flurry of staffers have left the White House, many who were ousted by Trump, as he has tried to respond to a series of problems, including infighting, a lack of legislative achievements and multiple investigations into Russian connections to his presidential campaign team. Federal law requires certain executive branch employees to file termination reports within 30 days if they have worked for more than 60 days. The reports provide information about potential conflicts of interest that existed when the staffer was employed by the government and any arrangements the staffer had for future employment once leaving the government. The attorney general could take civil or criminal action if a staffer fails to file. Filing a report late is punishable by a $200 fee. 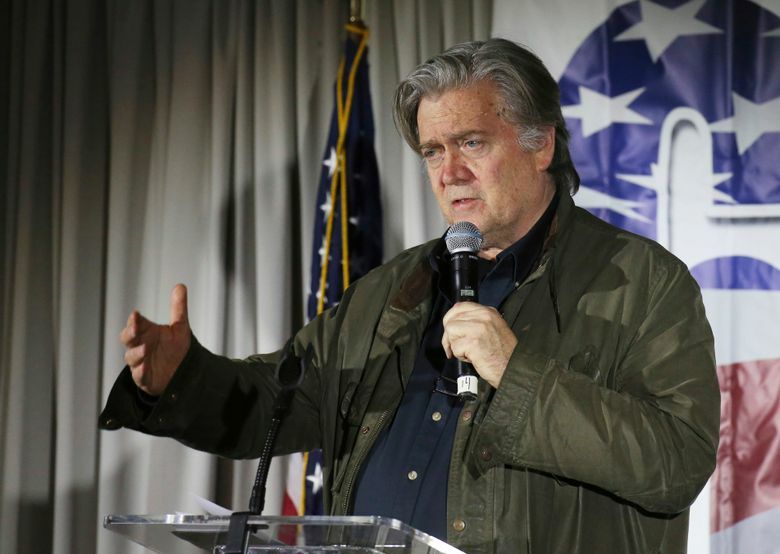 Bannon, for example, was supposed to sell his $1 million to $5 million stake in the company Cambridge Analytica while he served in the administration as part of his ethics agreement but it’s unclear whether he sold the stake. A firm with the same parent company as Cambridge Analytica, the business Trump employed to reach voters with hyper-targeted online messaging during the campaign, was hired by the United Arab Emirates in September to launch a social media campaign against its Arab neighbor, Qatar. White House spokesman Raj Shah said the White House doesn’t have an ability to force former staffers to comply with the law and referred questions to the individuals. Gorka did not respond to requests for comment. Cohen-Watnick declined to speak on the record before publication. But after this story was published, Cohen-Watnick said that he had not been notified that he was required to file and was only given the necessary information to file his report on Wednesday, despite his previous requests. On Wednesday, the NSC gave him 30 days to file. Harvey is now employed by the House Intelligence Committee. Jack Langer, a spokesman for Committee Chairman Devin Nunes, did not respond to a request for comment before publication, but on Wednesday he said Harvey is not required to file the financial form because of his transition to House Intelligence. The White House indicated that Harvey still needed to submit a termination report. Five staffers did file termination reports, including Deputy Chief of Staff Katie Walsh; Press Secretary Sean Spicer; Deputy National Security Adviser KT McFarland, who Trump nominated to be ambassador to Singapore; and Tera Dahl, deputy chief of staff at the NSC. McFarland filed her report after receiving a 45-day extension. The fifth, Mike Dubke, who resigned as communications director after three months in early June, filed his form after the 30-day deadline, according to the White House. It is not yet publicly available. It’s unclear whether he was granted an extension. A message left for Dubke at Georgetown University’s Institute of Politics and Public Service, where he is now a fellow, was not returned. Norman Eisen, who served as a White House ethics lawyer under President Barack Obama, said staffers should have been given instructions about ethics requirements, including filing termination reports, during their exit interviews. Spicer said he filed his report because he was told by the White House Counsel’s Office that he was required to do so. At least two White House staffers were not required to file termination reports because their tenures were so brief. Michael Flynn was fired in February after 24 days as Trump’s national security adviser for misleading Vice President Mike Pence about conversations he had with Russian Ambassador Sergey Kislyak in late December. Anthony Scaramucci served only 10 days as communications director before he was fired in July after blasting top White House officials in a media interview.